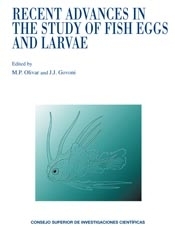 This volume includes fourteen of the contributions presented at the 29th Annual Larval Fish Conference of the Early Life History Section (ELHS) of the American Fisheries Society, USA, held in Barcelona, Spain, from 11th to 14th July 2005. The objectives of the Conference were to bring together the research community actively working on, or interested in, all aspects of the early life history of fishes, and to provide a forum for the exchange of information and ideas. Papers for this book were first presented during the Conference and prepared, peer-reviewed, and edited thereafter. The outcome is a set of papers dealing with relevant topics on fish larval ecology and the dynamics of marine ecosystems. The first two papers included in the book present new approaches and tools for the identification of the early stages of fishes. The next three papers relate to functional morphology, physiology and behaviour, and include a thoughtful review on how vitamins in maternal diet influence the quality of offspring. The next five contributions deal with larval condition, growth and survival, the analysis of the microstructure of otoliths, combined with the assessment of the biochemical constituents of larvae collected in the field is used to elucidate growth and condition, i.e. survival potential. The role played by fronts and eddies in generating pattern in pelagic habitats, the distribution and survival of ichthyoplankton, and the prey and predators of fish larvae is the subject of a paper that was presented as one of the keynotes during the Conference. Finally, ichthyoplankton distribution and transport, and the effect of environmental factors on spawning and nursery areas for several species, are presented in the last five papers of this book. We trust that the readers will find this book interesting, helpful, and useful.